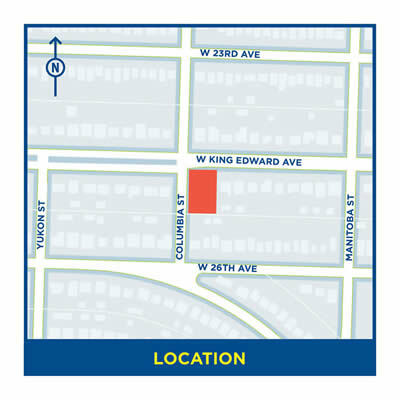 The City of Vancouver has received an application to rezone 188-198 West King Edward Avenue from RS-1 (One-Family Dwelling) District to RM-8AN (Multiple Dwelling) District. a floor space ratio (FSR) up to 1.2. The specific form of development will be reviewed through a future Development Permit process. The application is being considered under the Cambie Corridor Plan. The Plan identifies over 1,100 single-family lots for townhouses, creating opportunities for up to 8,200 units of this much needed ground oriented housing type. Due to limitations in infrastructure capacity in the Corridor, City-initiated rezonings for townhouses will be phased to align with infrastructure upgrades. The first phase of City-initiated rezonings was approved by Council in September 2018, and aligns with the first area of infrastructure upgrades. As part of the implementation of the Plan, sites designated for townhouse uses outside of the first stage of the City’s infrastructure upgrades will be considered through privately-initiated rezoning applications, so long as these upgrades are secured as conditions of rezoning. Rather than rezoning these sites to a site-specific Comprehensive Development (CD) district, they will be rezoned to the RM-8A/RM-8AN zone. This will provide the same certainty on the built form for residents and applicants that the City-initiated rezoning provides, and will also streamline the rezoning process. At the April 23, 2019 Regular Council meeting, Council referred this application to Public Hearing. For more information and to submit comments, please contact the rezoning planner.